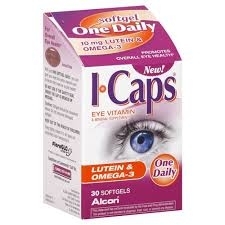 Keep your eyes in good condition with Alcon I-Caps Lutein & Omega-3 Softgels. This I-Caps eye vitamin promotes overall eye health with just one softgel a day. Developed by Alcon, the global leader in eye-care products, these Vitamin & Mineral Supplement Softgels in a 30-ct pack contain a wide spectrum of essential ingredients shown to promote healthy eyes. Alcon I-Caps Lutein & Omega-3 Softgels are enriched with 10 mg of Floraglo brand lutein and 2 mg of zeaxanthin, shown to help protect eyes. They also contain Omega-3 fatty acids, which are essential to maintaining retinal health. Plus, this I-Caps eye vitamin is enhanced with B vitamins, including folic acid, which are essential nutrients for eye and overall body health. So treat your eyes right, and include Alcon I-Caps Lutein & Omega-3 Softgels in your daily regimen.